Bali Livin serve for you Fast Boat transfers from Bali to Gili Trawangan – Gili Air – Lombok Island by the best fast boats selected. Accompanied with accredited captain and crew, we serve for you a comfortable and safety trip to the Gili Islands! We always offers special price without any extra charge for foreigner! Kuta , Legian , Jimbaran , Ubud Central area, Seminyak , Sanur. It’s a beautiful place with untouched beauty all around. And apart from that, there are also 3 different islands (Gili Trawangan, Gili Meno, and Gili Air) that you may visit for different things to do. 1. Instagram-worthy spots all around – Swing and hammock in the ocean. Whether it’s a rustically framed swing, or a hammock in the ocean – The Exile has it all! 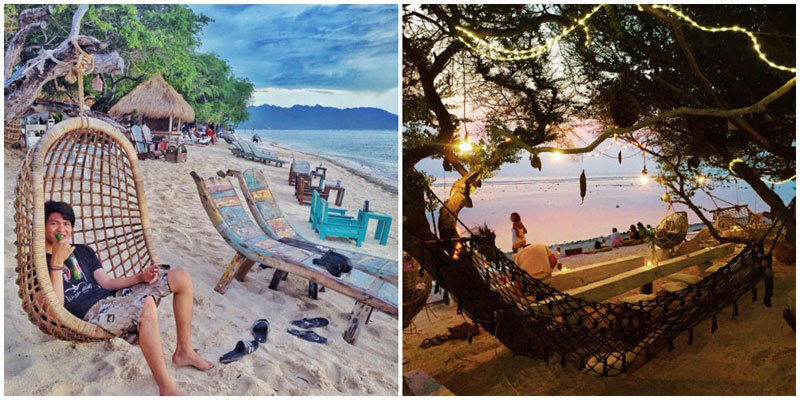 Check this off your bucket list on your next trip to the Gili Islands! 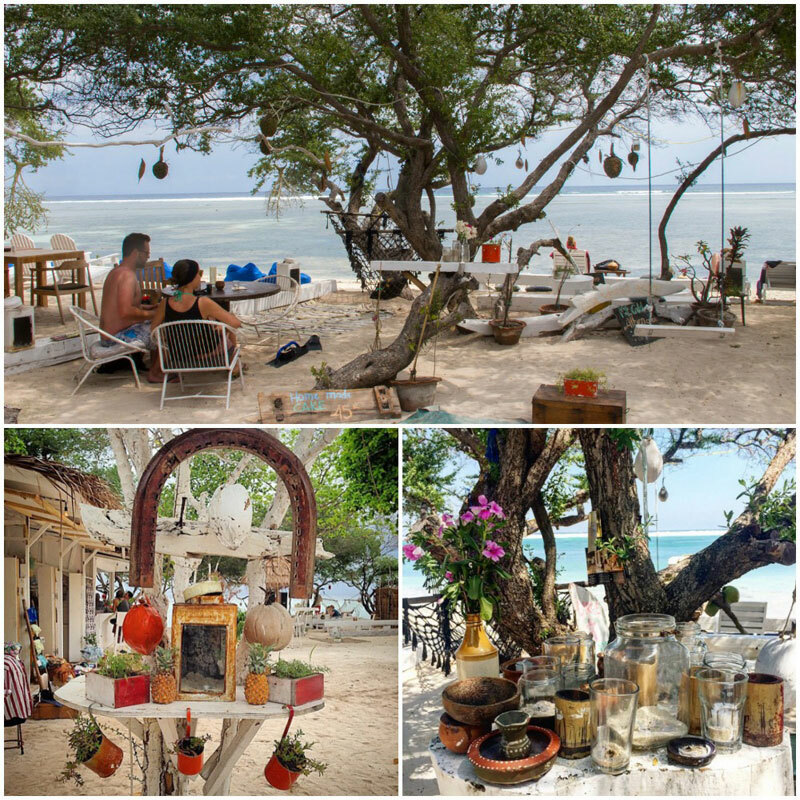 At The Gili Trawangan, you can also be assured of photos oozing rustic charm, with thatched roof bungalows in the background, bicycles and dramatic pieces of driftwood to pose with! This swings is located just 25 minutes from the harbor. You can go by bike or by horse cart (both of which present interesting photo opportunities). Everywhere you go in Gili Islands, the waters are so blue, they make the perfect backdrop for photos. 2. Clear bottom Kayaks – A Chillout way to see the reef and underwater scenery. You’ll even be able to get up close to the sea on the Gili’s special glass-bottomed kayaks. It’s exactly as its name describes, the kayak has a clear glass bottom so you can peer through and conveniently explore the ocean from above! 3. Snorkel directly from the island – Discover The Underwater Treasures. If you don’t fancy diving, or if you’re a bad swimmer, then try snorkeling. Off the north-eastern coast of Gili Trawangan is where you’ll find one of the best spots for snorkelling! There are many sea creatures here, underwater sculpture and sightings of turtles are frequently reported. It’s quite like a scene out of Finding Nemo with the clear blue waters, and colourful fish just swimming along. 4. Ride on a ‘seahorse’ – Go horse-riding in the sea! Now we can all ride ‘seahorses’ in Gili Islands! That is, horse-riding in the sea. It’s quite a magical experience, and you’ll feel almost at one with nature. Riding on a horse with the sea below you, the horizon before you and the bluest skies above – you won’t want this beautiful moment to end. 5. Cycling around Gili trawangan. Rent a bike and head out for half a day to explore Gili Trawangan. Non-stop the ride can take just under tan hour, or you can pack a bag (don’t forget the sunscreen) and ride around for a few hours with stops in between. The bike path does get covered in sand so be prepared to walk your bike for a little. This is a great activity for people who are looking for a little bit of exercise. Expect to See: Goats, The beautiful coast line the whole way around, plenty of hotels, plenty of huts to stop at and have a drink. Taking the laidback vibes of Bali a notch higher, there are several restaurants around Gili Islands – that provide the ultimate location to dine and laze to the stunning view of the crystal clear ocean. Casa Vintage Store is a really unique space that can’t be found anywhere else. Located on a back street near II Pirata, it doubles as a shop selling vintage apparel, and a bar. 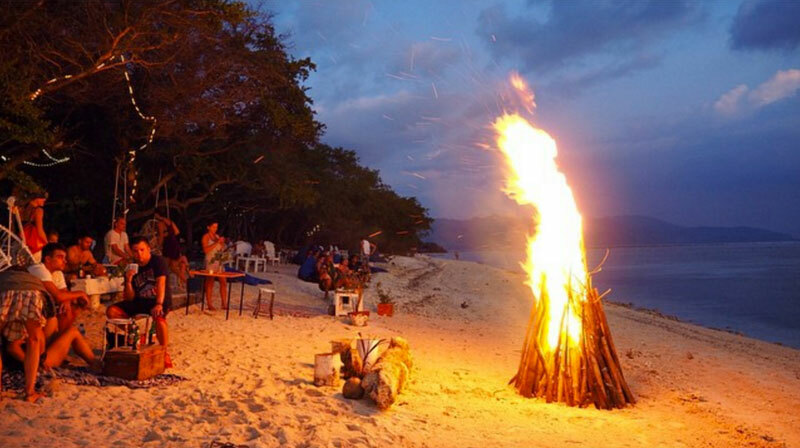 It’s home to a lovely bonfire every evening, and is also a perfect place to watch the sunset. Here’s your chance to be footloose and fancy-free with a quirky dance around the bonfire – it’s the perfect backdrop for one of those amazingly candid Instagram shots too! 7. There’s something for everyone – Island hopping at Gili Trawangan, Gili Meno and Gili Air. In case you’re looking for something more specific, the islands each cater for different people. 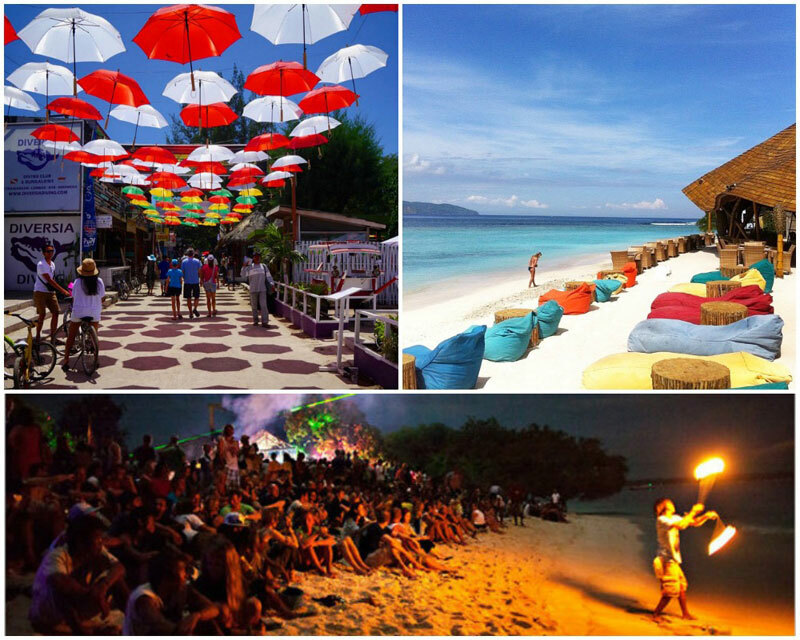 At Gili Trawangan, chill party seekers come here to enjoy the great nightlife. There are many beach bars with live bands that will provide the perfect soundtrack for your night. You can even have novel experiences like watching movies in a ‘cinema’ straw hut! The best price boat ticket I’ve seen! Great service & comfortable pick up service from our hotels to the harbour . andd.. the boat is also have AC & TV! I will give my friends your details for anytime they come over to use your service an next time I will to 👍 thanks for the good services! Hi mate, i got here safe & sound thank you.😁 I am just inquiring about to extend my return ticket?